An extremely practical and useful book to learn Machine Learning with Python. I was involved in the Technical Review for this book as a freelancer and I totally loved this book. 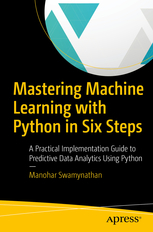 Manohar’s book is one among the best available books for a Data Science enthusiast to get started and learn Machine Learning concepts with Python. The book covers a wide array of topics in Machine Learning in the right depth and breadth. The author has done an amazing work in intuitively organising the content flow in the increasing order of complexity in a lucid language with simple, detailed and easy to understand examples. This is one of the most comprehensive guide for learning Machine Learning and I would highly recommend any data science enthusiast to grab a copy and start learning.